Stoneloops! of Jurassica is rated 4.0 out of 5 by 8. Rated 5 out of 5 by Mightypog from Best marble shooter Now I've played this, I don't want to play any marble shooters in which you don't pull the marble out of one spot and shoot it another. It adds a lot to the game. Looking for another like it now. Rated 5 out of 5 by mjholmes from Different take on the marble popper. This is a really fun game. I like it better than the standard marble popper (where the marble is in the shooter). 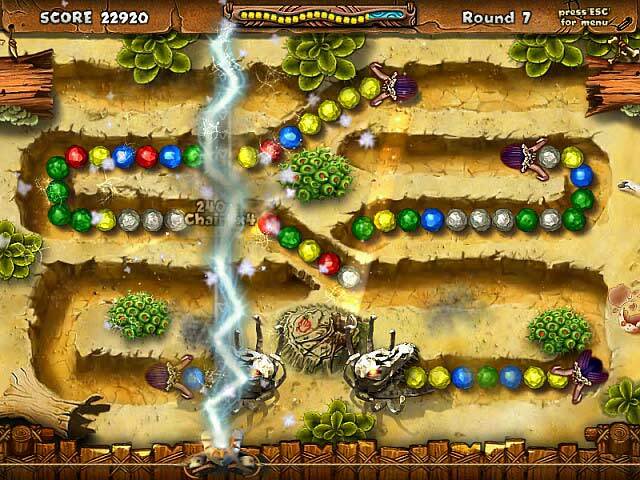 In this one you are picking and moving a marble and shooting it. Lots of fun. Rated 4 out of 5 by mrm2006 from Wow! Amazingly Different Stone Throwing Game! We've all played them before. Toss a colored ball/egg/orb/whatever into a stream of various colored balls/eggs/orbs/whatever. Well, now you have met your match. In THIS game, there is a unique twist. So beware! 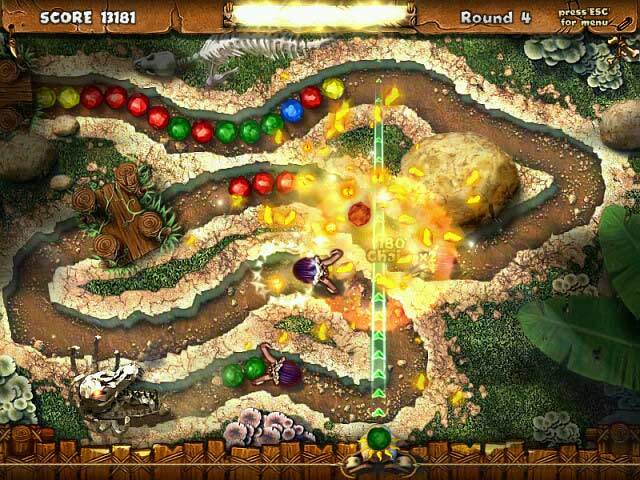 Yes, there is a stream (a very fast one depending on the level you play) of various colored orbs/balls/whatever - maybe rocks since it's the Jurassic Age. Yeah, for the sake of keeping it short (hah!) they are rocks. So, you have a stream of various colored colored moving along the road. This is what you have to do .... GRAB a rock of whatever color you choose (but choose fast and wisely) and toss it BACK into the stream to make a group of 3 or more to destroy them. Get it? GRAB a rock FROM the stream and toss it BACK into the stream. It will probably take a few levels to wrap your head around this very different way to play this game but it does have it advantages. For instance, there is a group of 3 green rocks. Grab one of those rocks and toss it back where you got it from - BOOM - group of 3 original rocks gone. That will come in handy as you level up because things do get progressively harder, much harder. There are bonuses you get when blowing up these rocks but I couldn't even begin to tell you how they're earned. There are bonus levels. Again, streaming row of various colored rocks. But, you have to grab the color of the obelisk (totem) that rises up from the ground and shoot it. Get 3 of the same colors in a row for a bonus. So, green obelisk, grab a green rock and toss it into the green obelisk. You apparently also have a tree house of sorts. Not very pretty and, although after every "x" number of levels, you earn an upgrade. Most of these upgrades are difficult to see because they are the same color as the hut (brown) but some are quite obvious. So, that's how you play this unique twist on our favorite game. Not a purchase for me because even on "easy" it was too fast for me but I do recommend everyone try it. If only for the uniqueness of the game. Happy Gaming! Rated 4 out of 5 by shorenuf from This game rocks! I am not good (terrible, actually) at these shooter games. This is possibly the only one where I have ever felt at all successful -- well, at least I didn't feel totally beaten by the third level. The mechanic is a bit different from others. And, you don't lose lives and lose the game -- you can repeat the level if you fail. That said, it's been on my Mac for a long time, but not a game I go back to or ever near finished. Three modes of play -- strategy, survival, and classic. Lots of different power ups to collect. Lots of action when you catch them. Collect jewels after each completed level. Earn achievements. Build a village. Older (2008), not wide screen, but colorful, plays in Mac OS LION. If you have never tried a Marble Popper game (in this case rocks), or if you think you couldn't succeed at this type of game, give this one a try. I was only going to see if it would open in LION for the purpose of this review, and ended up playing a few more levels. I played with a sense of confidence and it was even fun! 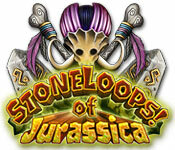 Rated 3 out of 5 by GrrlScientist from stone age marble popper this is a typical marble-popping game with one variation: it takes place in the stone age, so dinosaurs do pop up from time to time. 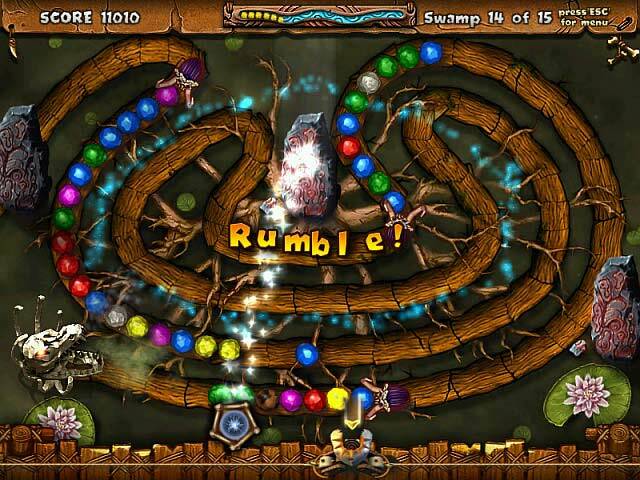 the goal of this game is to smash groups of stones by shooting a coloured stone from your slingshot into groups of three or more with the same colour. if you succeed at that without the fossil dinosaur skull swallowing the stones, you collect trophies and points, which you then use to upgrade your houses. graphics: i didn't expect much so the graphics surprised me -- they're actually pretty good. music and sound effects: rather annoying, actually. the booming voice proclaiming "GOOD" or "AVALANCHE" got a bit annoying after ten seconds or so. storyline: somehow, smashing stones is supposed to help you upgrade your (wooden) treehouse, although i am completely confused as to how those two events are related to each other. but on the other hand, this is a marble-popping game, so the storyline is a bit of an afterthought, isn't it? gameplay: straightforward with no sluggishness. my interaction: one hour demo, normal mode (this game has three modes; easy, normal and challenge. a fourth mode -- “skill master” -- must be unlocked by completing a game first). i played “classic” (this game has several “play” types as well; strategy and survival must be unlocked after a minimal number of accomplishments have been achieved, and i managed to unlocked them whilst in demo mode). these different game types certainly increase replayability. if you like marble poppers, then i expect you'll like this one, too. if you are not a fan of this type of game, i doubt this one will change your mind. this is a good family game, and i predict the kiddies will especially like it (the pterodactyls flying over the game board are a nice touch). Rated 2 out of 5 by Menolly324 from The idea's good but...... This is based on only the trial. I liked the concept. Instead of shooting bubbles you take out a marble from the string and put it somewhere else in the string to make matches of three or more. All I was getting was frustrated. The game was way too fast paced for me right from the beginning of the game. Charma is the same in that you take out a single ball from a string and place it somewhere else in the string to make matches. It begins easy and builds up as you become adjusted to play.